I'm borderline obsessive over Mexican food and during the cooler months I'm full-on obsessive over soup. So, when the two are combined, I'm in heaven. 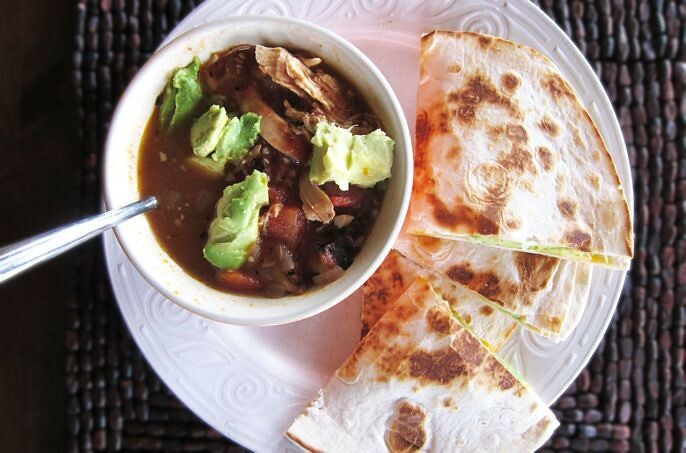 I recently found this delicious recipe for Chicken Tortilla Soup and feel compelled to share with the rest of the class as it's become my new favorite. It most assuredly will not disappoint. 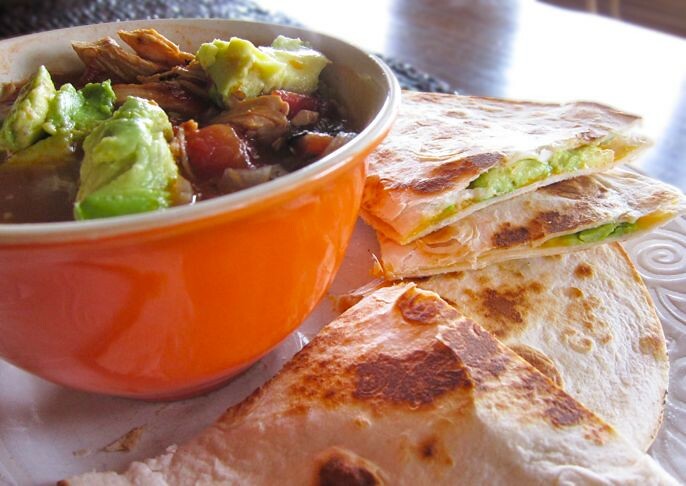 I'm also an avocado freak pairing the soup with simple avocado and cheese quesadillas. Poach chicken in chicken broth with bay leaf. While the chicken poaches, cook bacon in a soup pot over medium-high heat until crisp. Drain off excess fat, leaving 2 to 3 tablespoons in the pan. Add onions and garlic to the skillet and cook 5 minutes then stir in chipotles and tomatoes. Remove chicken from stock, dice and then add to soup. Pass stock through a strainer then add to the soup. Serve topped with shredded cheese and crushed tortilla chips. Or substitute the tortilla chips, as I did, with a crisp avocado and cheese quesadilla. This looks so good, definitely want to try! That looks fantastic and you won me over with the avocado! If I didn't know better I'd think I was pregnant with the avocado cravings lately (I'm not!). I just finished dinner and you've got my mouth watering all over again! This looks absolutely fabulous. I do love me some Mexican food too. The avacado quesidillas sounds amazing. I wish the hubs like avacado the way I do....thanks for the yumminess! This sounds amazing! Perfect for colder weather. I love avocados, too. It looks so yummy, especially on a cold day like today. It snowed! Our little grocery doesn't have a few of the key ingredients, so I'll have to make do with something similar. Oh wow - that looks gorgeous - to look at and eat!